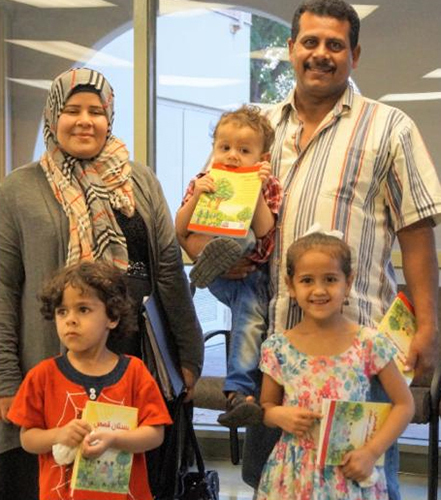 A family from Disciples of the Way, an Arabic-outreach ministry in Texas, receive their new Arabic-language Bible storybooks from LHF. More than 420 million people worldwide speak Arabic, and not surprisingly, many of those Arabic-speakers are Muslim. But what might be surprising is how few Christian – and more specifically, Lutheran – resources exist for sharing the Gospel with Arabic-speakers. Now, thanks to LHF’s partnership with Lutheran Hour Ministries (LHM) and the Michigan and Carolinas LWMLs, a new book for telling Arabic-speaking children about their Savior is available: A Child’s Garden of Bible Stories. LHF has published 3,000 copies in hardcover and paperback. A second printing is being planned by LHM’s director of activities in Lebanon, Fadi Khairallah (who also translated the text). Those books are being distributed to Christian radio contacts throughout the Middle East, as well as to Arabic-speaking immigrants and refugees in Europe. Arabic-outreach ministries here in the United States are already receiving their copies of A Child’s Garden of Bible Stories. Joy Markus is a Muslim convert and outreach coordinator with POBLO, an Arabic-outreach ministry in Michigan. “[This book arrived] right on time, when I had just started student ministry in Dearborn,” she said. Markus and her Arabic-speaking students meet in homes, read their Bible storybooks and then enjoy ice cream together. Because most of her group come from Muslim families and are new to Christianity, A Child’s Garden of Bible Stories provides a perfect starting point for teaching the faith. For example, Markus recently taught her students about Adam and Eve. “This is the first time they’re learning about original sin,” Markus explained. Even the small details make a big impression on children who have never heard these stories before. “They were surprised to learn that God made clothes for Adam and Eve from leaves,” she said. To order copies of the Arabic edition of A Child’s Garden of Bible Stories, call the LHF office at (800)554-0723 or send an email with your request.